Posted in: Delray Beach, Guest Writer, On Site. Tagged: 2015 ATP Delray Beach Open qualifying, 2015 ATP Delray qualifying, 2015 Delray Beach Open, 2015 Delray Beach Open by the Venetian Las Vegas, 2015 Delray Beach Open presented by the Venetian Las Vegas, alex kuznetsov, Aljaz Bedene, atp, ATP 250, ATP Delray, ATP Delray 2015, ATP Delray qualifying, ATP World Tour, delray beach, Delray Beach Florida, Delray Beach Open, Delray Beach Open by the Venetian Las Vegas, Delray Beach Open Presented by the Venetian Las Vegas, Delray Beach Open qualifying, Delray Beach Qualifying, Delray Beach Tennis, Delray Tennis, Eric Quigley, Guido Andreozzi, Jessica Luzadas, jp smith, Marcos Giron, Robby Ginperi, tennis, Tennis Florida, Thanasi Kokkinakis, USTA Florida, Victor Hanescu, Yoshihito Nishioka. Young guns Yoshihito Nishioka, Thanasi Kokkinakis, and American veteran Robby Ginepri were among qualifying winners in the second round of qualifying, completed today at the Delray Beach Open in Delray Beach, Florida. The Japanese player Nishioka scored a win over American Marcos Giron a former UCLA product, he came back from dropping the first set 4-6 to win the final two frames 6-3 6-2, as Nishioka starting mixing in aces (8 over the final two sets) and frustrating Giron who wilted in the end, allowing Nishioka to win 29 out of 47 points in the third set. Previously, Nishioka defeated former VA Tech Hokie Patrick Daciek in the first round of qualifying in 3 sets 6-3 4-6 6-4. Thanasi Kokkinakis continued his rise to ATP stardom, dominating Argentine Guido Andreozzi 6-3 6-2. Andreozzi clearly preferred playing on clay as he generated just one break point against the Australian, in a contest that barely last an hour. On Saturday, Kokkinakis likewise had no problem earning a win, beating wild card Ty Trombetta 6-1 6-4. A player with much more experience than those two young guns, American Robby Ginepri, the former US Open semifinalist (the last American to reach the semis of a slam), defeated an in-form Aljaz Bedene 6-3 6-4. Bedene, previously reached the final in Chennai this year as a qualifier and also qualified for the Australian Open, but on this day Ginepri played more efficient tennis, breaking Bedene on 4 out of 5 chances, twice in each set, to win the match. Ginepri’s third round qualifying opponent will be JP Smith of Australia, the former Tennessee Volunteer beat Kiwi Michael Venus, who formerly played at LSU. The scoreline for that one was 2-6 6-2 6-4. Previously Ginepri beat Gianni Mina in round 1 6-2 6-2, and Smith beat young American Jared Donaldson who was coming off a win in the Memphis maindraw, in round 1, in an upset. Kokkinakis’ third round opponent will be American veteran Alex Kuznetsov, Alex K beat Chunan Wang of China in round 2 today 6-4 7-6(5). Kuznetsov beat 19 year old Spaniard Jaume Pla Malfeito in round 1 on Saturday 6-4 6-1. For Nishioka, American Sekou Bangoura awaits in round 3 tomorow, Bangoura pulled off a slight upset over young American Noah Rubin 6-4 2-6 6-4. The 18 year old Rubin, who is 0-2 in previous ATP level main draw matches, will not have his third try at a main draw win in Delray Beach this week. Previously Bangoura beat Artem Smirnov 3-6 6-4 7-6(7). The final qualifying spot will be decided between veteran Romanian Victor Hanescu, who normally has his best showings on clay, or American Eric Quigley. Hanescu beat James McGee 6-3 4-6 6-4 on Saturday and Pavel Krainik 6-2 6-3 today. Quigley beat Facundo Mena 6-7(2) 6-3 6-3 on Saturday, then slipped past Chase Buchanan, a former Ohio State product, in a 3 set epic today 4-6 7-6(7) 7-6(3). 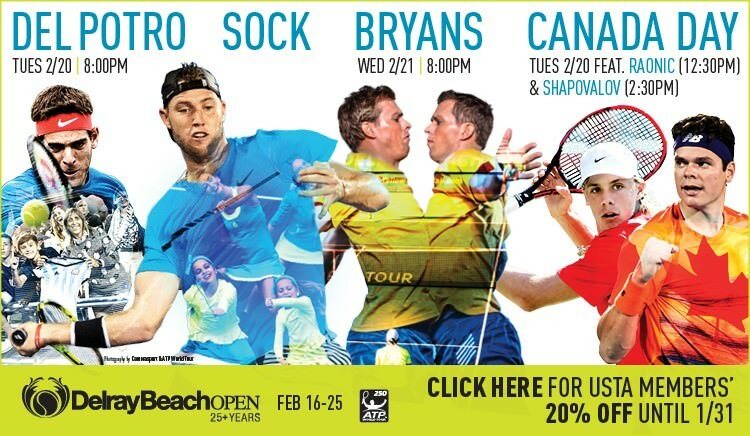 Tomorrow in Delray I will have coverage of the final round qualifying matches along with main draw action featuring exciting talents Alex Dolgopolov, Denis Kudla, and Dustin Brown among others.